Fugly Horse of the Day: Let's talk supplements! 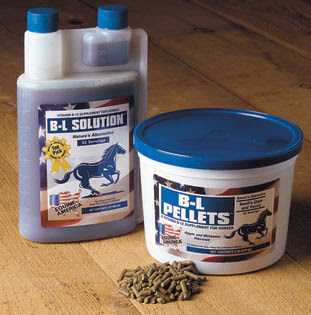 Right now there are an amazing variety of supplements on the market for our horses. I know there are folks here in the anti-supplement camp, who say that good feed is all you need. Let's face it though, most of us do not know EXACTLY what we are feeding. Most of us do not have a nutritional analysis done on our hay. So some extra vitamins can't hurt, nor can some herbal solutions for arthritis, poor feet or other problems our horses may have! Here are some of the supplements I love. BL Solution - OMG, this stuff ROCKS. I have seen such a difference in my two old arthritic mares. And they feel great on it - they are running and bucking again! I will be ordering another big jug soon and I don't care if it's $50. It's worth it. Also, it is yummy and they will eat it. Clovite - I have been using it since the 80s and have no intention of messing with what works. It's just a good all-purpose vitamin supplement. Grand Complete - Not using it right now, but I do think it's really good stuff. It's an all purpose supplement with biotin for the feet. Strongid C - Argue with me all day about worms developing resistance, but this stuff has really helped my debilitated rescues come back from the damn-near-dead. What I like is that it's milder than slamming them right away with a paste wormer and I think that reduces the risk of a worm impaction colic. It helps start cleaning out their system and making it possible for them to pack the weight back on. I love it. Grow Colt - Another supplement that has been around forever, and it is good stuff. My orphan had it added to his feed from early on and now I have a 15.3, nineteen month old orphan. Yeah. I'm sold. 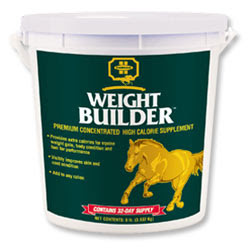 Farnam Weight Builder - I've tried them all and this is the one I find works the best. Sand Clear - if you live in a sandy climate, this stuff will save you a $5000 colic surgery or a lost horse. Use it religiously, one week a month. Very small price to pay for avoiding sand colic! Finally, you cannot beat plain old corn oil for putting a shine on their coat and packing on a few extra pounds. My favorite place to get supplements is Country Supply. The prices rock and I have never had a problem with them. And I have to say - I never used SmartPak before, but have recently been introduced to the joy of it...you know what? It is a great idea. It's perfect for people who board and cannot count on the people feeding their horses to have two IQ points to rub together. It's idiot proof for your non-horsey husband, farm sitter, or disinterested teenage child, and it's just plain convenient. They don't have everything available, but they have a lot of it. So what do you love? What do you think is the best thing since sliced bread? Rave about your favorite supplements and help your fellow horsepeople choose! King 5 does it again! Nothing tastes sweeter than justice! A better way to place a horse with no value! Who gets the last lifeboat? The blue light specials are everywhere! You CAN teach an old horse new tricks! Good rules for selling horses! And a rescue steps up to the plate! Hey FHOTD readers, I have a job for you! OK, so who is the asshat this time? All right, you asked for it! Stupid is as stupid posts! How bad does it have to get before they stop?